He lunged at her with scissors and yelled, "I'm going to kill you " He tried to stab her, but she was able to wrestle the scissors from his grasp. She began to sob, not because she was being attacked, but because the attacker was her three-year-old son. Anne's survival toolkit evolved from numerous days like these. 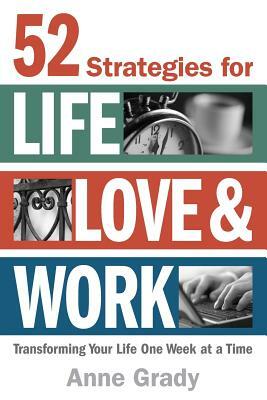 52 Strategies for Life, Love & Work is a collection of success strategies that can be applied weekly to make gradual changes in all areas of your life. If you're seeking change in your life, 52 Strategies for Life, Love & Work will help you improve your relationships, increase your productivity, and ignite your success. With topics ranging from dealing with difficult people to navigating and managing change, productivity, happiness, and more, these 52 strategies provide a week-by-week template for success that will keep you motivated to making positive changes in your own life. "Anne Grady provides thought-provoking ideas on how to be more effective and how to live life fully. She shows us how to drive forward in a bold way. Honest, smart, and direct-a great handbook with actionable ideas for success in all parts of life." "Anne Grady has found a way to turn the incredible adversity she faces each day into easy-to-apply strategies that can truly transform the way you approach your life-both personally and professionally. 52 Strategies for Life, Love & Work is a truly inspiring read that will leave you wanting to actively make changes to be your absolute best." "Anne Grady has provided a road map for how to take hold of your life, your outlook, and your success. She writes with tremendous insight, warmth, and a thoroughly infectious spirit." Anne Grady is living proof that making tough changes can have monumental results. As a nationally recognized speaker, author, and consultant, Anne candidly shares her own journey and the lessons she's learned to help organizations and the people in them achieve lasting results. As Founder and President of Acclivity Performance and the Anne Grady Group, Anne works with a diverse array of companies, not-for-profits, government agencies, and individuals, and uses her unparalleled ability to help her audiences implement solutions for the real issues they face every day. Anne helps guide organizations toward changes that build teamwork, increase productivity, and reduce stress. Anne incorporates the very mantras she champions professionally into her personal life to work through the challenges she faces each day as mom of two, one with special needs. With her signature style of wit and candor, Anne helps people transform the way they approach life, love, and work. Anne holds a master's degree in Organizational Communication. She lives in Round Rock, Texas, with her husband, two children, and their "therapy" dog Bernie. For details on how to bring the strategies in this book into your organization, or to learn about the other organizational development solutions available, contact Anne at (512) 821-1111 or email her at anne@annegradygroup.com. Visit her online at www.annegradygroup.com for information, scheduling press interviews, availability, and fees.